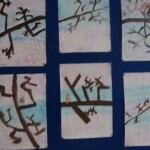 The pupils in Room 9 were creating very beautiful pieces of winter art. They used paint to create a background wash. Then they added branches of a tree and placed hand drawn robins on the branches. 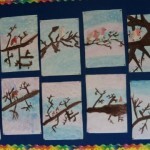 Posted on December 10, 2013 by stlouissps • This entry was posted in Arts and Crafts and tagged Room 9. Bookmark the permalink. I think they were a bit hard but lots of fun! !